Note: FS = flowering size. FS-1 = one year to flowering. Bulbil = 3 - 4 years to flowering. NEW: The price applies to: 1 x FS bulb or 2 x FS-1 bulbs or 10 x bulbils. Late Spring Large pink flowers with a pursed lip, marked yellow or orange, with white hairs. Makes large pseudobulbs. Prefers compost of mostly moss. Late Spring Mauve pink with dark lip markings. Variable. Very attractive when massed in a bowl. The most widely distributed pleione of all. Easy to grow. Pale rose & cream, variable from near white through all shades of pink. The lip is near white with pink, purple or brown spots. Excellent beginners' orchid, prolific grower. Makes large bulbs, mostly with more than one stem. Sparkling white flowers with lemon yellow spots in the lip. Long stemmed and most attractive in a group. Prolific grower producing large, multi stemmed bulbs. picture to come formosana 'Verdi' £5.00 April / May Delicate pink/violet shades, varying from deep on the petals to lighter in the lip. The interior of the lip is marked with terracotta spots. A very strong grower, making several new bulbs per season. Large, sparkling white flowers. The lip is large with many frills and fringes, marked with yellow, orange or brown spots. Very attractive. A beautiful variant of the white P. grandiflora. It has large near white to pale yellow flowers with a frilled and fringed lip, near white to lemon yellow. This is overlaid with orange, terracotta or brown markings. Very showy, an eye catcher. Autumn / winter flowering. 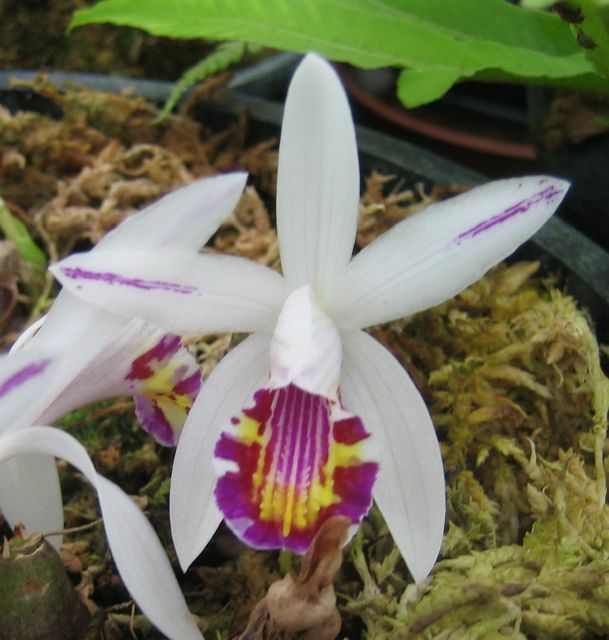 A tropical pleione, requiring warm conditions. The flower is white with a most distinctive lip, white background, striped and blotted in purple with a yellow central patch. Fragrant. Requires intermediate temperatures, no less than 15°C. Not easy to grow. Autumn / winter flowering. Flowers pink with lighter coloured, tubular lip, on erect stems, often two flowers per bulb. Flowers are long lasting in cool temperatures and have a delicious scent. Strong grower.